Can you be Amish – and belong to another church at the same time? Andy and Naomi Weaver believe the answer is yes. One day, about five years ago, Andy, who by now had married Naomi and had several kids, met a Seventh-day Adventist who shared some literature with him. After discussing Bible teachings on the end times, the Adventist member encouraged Andy to read the Bible in a language he could understand. Before long, however, the couple understood that following a path of obedience to Bible teachings would get them excommunicated from their community. “It put me in a hard spot,” said Naomi in an interview recorded a couple of years ago. She felt they would dishonor their parents by keeping the Saturday Sabbath and following all the Bible teachings foreign to their community. Naomi shared that eventually, she decided to do “what God wanted [them] to do.” She felt that somehow, God would take care of them. The couple formally joined the Seventh-day Adventist church in August 2014. Their worst fears, however, came true. When the community found out, they were shunned. They were barred from attending community or family meetings and gatherings. West Salem is part of the Lodi Amish community, a Swartzentruber group which we’ve covered here before (most recently on the remarkable story of Levi Shetler, who has been in 14 separate buggy accidents). It’s a very plain group, so you can understand the response (though truth be told, Amish in more progressive communities would respond similarly – Amish do not recognize membership in multiple churches). While during the first few months the Weavers went through financial hardships, they believe that God opened a way for them to make a living. And, as they share, through a series of miracles, a property was provided with a small two-bedroom house on acreage. 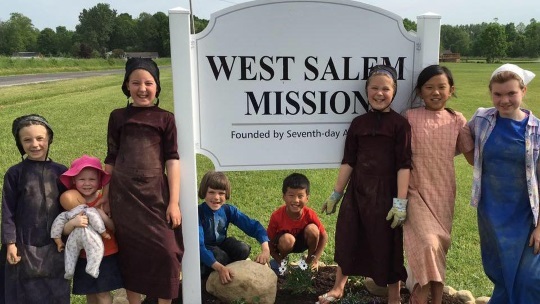 There they launched the West Salem Mission in June 2015, with the goal of sharing the Bible’s full message with others in the community. The property house was quickly converted into a small worship center and is currently doubling as a space for the home school group. An Amish Seventh-day Adventist Church. Sounds like a contradiction in terms. This article again brings up the question of whether “Amish” is a religion or a culture, which we’ve explored here before. It seems that the Weavers, who continue to dress plain, are treating the Amish part of their background as more of a cultural element, as spiritually they have aligned with a different movement. People who leave the Amish often consider themselves “ex-Amish” or “former Amish“, in other words, no longer Amish. They may say they were “raised Amish”. There are churches who cater to ex-Amish (or soon-to-be-ex-Amish) people, for example those of the Charity movement based in Lancaster County. Whether the Weavers manage to keep a foot in both worlds or not, this story reminds me of the richness and diversity of religious belief in North America. While their home community certainly doesn’t condone being a part of two religious groups simultaneously, the Weavers want to make it work somehow. Coincidentally, I recently came across a video of Andy and Naomi appearing on a Seventh-day Adventist television program. They’re a likable pair. In the video, they explain their faith journey and Amish customs. 47 responses to Amish Seventh-Day Adventists? Great. Everyone needs to pick up a Holy Bible and read it. God will open your eyes to the truth. If Amish is used as an ethnic label, then it is possible to be both Amish and 7th Day Adventist. However, the term “Amish” or “Mennonite” should not be an ethnic label. Cory Anderson is not an ethnic Beachy Amish, but is still a member of that church. Same goes for Mark Curtis. There are many who are Amish or Mennonite by choice, rather than by birth. Andy and Naomi are Amish by birth and by dress but are not practising Amish as they have given up all but the most visible part of being Amish. Osiah since this site has a pretty defined focus (Old Order Amish) I also favor the term Amish being used to describe religious identification/membership. However I have often heard from Amish-raised or even baptized people who are no longer members or associated with an Amish church who still consider themselves Amish or part-Amish, by which they are referring to their cultural identification, or way of thinking, or lifestyle, etc. Maybe if another term was used like “Amish-raised” or “culturally Amish” it would clear up potential confusion. Hi Anita I am familiar with Unser Leit but have to admit have not read it 🙂 I guess I’ve been daunted by the size so have put off diving into it. I know quite a few people have commented that it is well done. Am currently reading another sizable book (though not Unser Leit scale) – Mark Louden’s Pennsylvania Dutch: The Story of an American Language. Quite interesting so far from both a historical and linguistic perspective. OSIAH HORST What do you describe as the most visible part of the Amish? “as they have given up all but the most visible part of being Amish.” The most visible part of being Amish is obviously the cultural aspects – every one knows what Amish look like (even though they obviously do not all look the same.) but none of can know the spiritual part of an Amish person by looking at them. The picture shown with this post would seem to be of an Amish couple – that is all we can see in the picture. But if they have left the Amish faith, if they have abandoned the Amish teaching and way of life, they can no longer claim to be Amish. They may retain some aspects of Amish culture – that will probably never be lost completely. hmm, well, anyone who has read the Bible, knows Saturday is the Sabbath, not Sunday. The Roman Church kept the Pagan day of SUN-Day as a factor in destroying believers adherence & loyalty to the Commandments. So the real question is why Amish & most Brethren, ignore God’s commandment & still kneel to the Roman paganism. Seems to rational people, that if we wish to follow God’s laws & standard then Saturday has to be maintain or reaffirmed as the Sabbath. Goodness! Clearly these people are no longer Amish. They’re being interviewed, and attend services in a different church. Is looking Amish more financially rewarding? As for the Bible revealing the truth, whose truth would that be? Yours or mine? they not longer adhere to tenets of their former congregation. the problem here is one of labels. They tenets seem t be still Brethren,, just not what Jacob Amman wanted. They are now Sabbath Brethren. Going back to a valid belief. Ia there more than one truth? Amish are followers of a doctrine of Yakov (Jacob) Amman. It is a variant of Mennonite or Brethren or Anabaptist philosophic reformation including the ancestral forms of current Baptists groups. The Old Order German Baptists keep many of the CULTURAL aspects, dress, morals etc. As do Hutterites, many Mennonite groups, but they are not Amish i.e. followers of Jacob Amman. The problem here partially is that most English see the Amish as a unified doctrine group, that is not accurate. each congregation has its standards. There is no reason that the Weavers can not be the beginning of a BRETHREN movement to return to more adherence to more of the 613 commandments. Seems like good, moral decent people. We would not shun them because of that. The Sabbath is a sign! Those who read their bible will know that the Sabbath is a sign for those who “do not believe” 1 Cor. 1:22, Ezek. 20:20, 1 Cor. 14:22. The Christian preoccupation should not be seeking signs but rather listening for “Sounds” Rom. 10:17, 1 Cor. 15:52. Saturdays was a Jewish law. Christians are not under the law so that is why it is on Sunday. So.. My name is savanna and I have a husband and the oldest of my 3 turned 5 in June. I was lead to an Amish book in our hometown here in bellville tx. And not only are we interested but we do believe this is how we should be living our lives and raising our children this way. But as you know. We are all sinners and if I could I would beg me and my family’s way into a amish community. My question is. Will a amish church/community will ever except me and my husband because we both have tattoos. I understand now Jesus dose not want you to permanently damage your bosy. And I’m ashamed of the way he sees me now. But again. I would beg me and my family into an Amish community if they would let me. Biblical Law is the only religious law for any Christian group. We see neo-heretics, making endless excuses & inventing nonsense to justify their groveling to Roman Catholic Church & it’s practices. but quote “I come to FULFULL the LAW, not to destroy it.” Changing Sabbath to the pagan Sunday is destroying the law. & is close if not actual blasphemy? are forgiven in Jesus’ Holy Name. I will be interested to read the comments on this article. I have wondered about the faith aspect of the Amish. The cultural side is easily seen, but I’m not sure what beliefs they actually hold. I know they are Christian, but there are a lot of different denominations with a lot of variation in how they organize their church and how they interpret the Bible. Amish beliefs are the same basic beliefs you find in any non-cult Protestant church. The real differences (as with any Protestant denomination) come with Communion, Baptism, and lifestyle/conduct. Cults differ from other Protestants in their beliefs about the Bible, Jesus, and other believers, to simplify. Amish have the same Belief as other? Barb Zimmerman If you think the Amish have the same belief as other churches, why is it the strict Amish believe they are the only ones going to Heaven? Who is going to Heaven when they die? I have just one simple question! #1 many different cultures and beliefs call themselves Christians? #2 many people are believers and are faithful to an assembly, still others may not belong to an assembly! Which ones does the Bible say are saved? Please leave your choice and why. that are on their way to Heaven 100% for-sure! I believe I’m still of an Amish Heritage. I was born and raised Amish in Arthur Illinois. This is a dangerous area for Amish and all Christians. Is our belief an inheritance or a decision? Seems like a slavish adherence to the Bible as translated into English (which of the dozens of versions are these folks promoting?) and not taking it from the original Greek or Hebrew, much less the Old German. But for that matter, why make the Bible the sole guide to life? After all, it wasn’t officially adopted in its current form until the Council of Trent in 1546. To be sure, it was generally accepted by the Fourth or Fifth century. Still many centuries of Christians lived and died without believing that the Bible was the sole guide to a good life and death. Then there are the dozens of internal contradictions, ranging from two different genealogies of Jesus in the Gospels to disagreement over when the Last Supper happened. Boyce Rensberger I wish you would decide what you or who you believe and trust! I don’t wish to be mean, however you will have to make a decision what you believe before you die! There is no changing of ones mind after that death call! Hi Erik, The disciples of the early church met for communion and worship on the 1st day of the week, Sunday, from the beginning. Acts 20:7. A collection was also taken on the 1st day of the week. 1Cor 16:2. Jesus rose on the 1st day of the week. Matt 28:1; Mark 16: 2+9; Luke 24:1; John 20: 1+19. God instituted the Sabbath, the 7th day of the week(Saturday), for the Jews as a day of rest. In Genesis God tells us that He rested from His work of creation on the 7th day. Our rest is in Christ, not the Sabbath of the Old Testament. True born-again believers rest in Christ. The Good News of forgiveness, salvation, and eternal life-a free gift-through Jesus Christ alone. Not of works that anyone should boast(Ephesians 2: 8+9). Carol it is so simple most will not find the truth, because everyone thinks I have to do something to be saved! When in reality people will do more for Jesus after they understand He paid it all 2000 years ago and it all depends on what He did, Not what I do! Here is something I wish I could mail to every home in America! Arranged by someone that cares for you! In the beginning God the Father said to God the Son and the Holy Spirit, “Let us make man in our image, after our likeness, so they may rule over the fish of the sea and the birds of the air, over the cattle, and over all the earth, and over all the creatures that move on the earth. Adam was made? Soul, Body, and Spirit! Body (Like Jesus) That which was created by God the Holy Spirit and nurtured by Mary, Spirit a part of the Holy Spirit! They are now different from God they are a Two Fold Person, only Soul & Body! All people are born in the likeness of Adam: a Two Fold Person! Only after the Second Birth are people like God again a Three Fold Person! 16 For God so loved the world, that he gave his only begotten Son, that whosoever believeth in him should not perish, but have everlasting life. 17 For God sent not his Son into the world to Condemn the World; but that the World through Him Might Be Saved. 18 He that Believeth is Not Condemned: but he that Believeth Not Is Condemned Already, because he hath not believed in the name of the only begotten Son of God. 19 And this is the condemnation, that light is come into the world, and men loved darkness rather than light, because their deeds were evil. 20 For every one that doeth evil hateth the light, neither cometh to the light, lest his deeds should be reproved. 21But he that doeth truth cometh to the light, that his deeds may be made manifest, that they are wrought in God. This is the question do we believe it! God Bless you, as you ponder on these things! Where you will spend eternity will depend on it! Be informed Carol on the Jewish calendar. Its sundown to sundown not midnight to midnight like that of Gregorian calendar. Acts 20:7 happened on saturday evening (gregorian) or 1st day of the week (jewish). Saturday evening is already 1st day in Jewish calendar.Proof – theres many lights & Eutychus fell coz it was a long worship service, he was there since early sabbath morning as a usual practice. Apostle Paul was breaking bread coz he has to depart to Assos in the morning. Acts 20:7 And upon the first day of the week, when the disciples came together to break bread, Paul preached unto them, ready to depart on the morrow; and continued his speech until midnight. 8 And there were many lights in the upper chamber, where they were gathered together. 9 And there sat in a window a certain young man named Eutychus, being fallen into a deep sleep: and as Paul was long preaching, he sunk down with sleep, and fell down from the third loft, and was taken up dead. Act 17:2 And Paul, as his manner (or CUSTOM) was, went in unto them, and three sabbath days reasoned with them out of the scriptures. Act 18:4 And Paul reasoned in the synagogue every sabbath, and persuaded the Jews and the Greeks. Compare Paul to Jesus custom or habit. Luke 4:16 And he came to Nazareth, where he had been brought up: and, as his CUSTOM was, he went into the synagogue on the sabbath day…Jesus, the way, the truth & the life. He is our example as a true believing Christian. He changed not…Mal 3:6, the same yesterday, today & forever Heb 13:8. He is also the Lord of the sabbath Mark 2:28. Enjoy then His fellowship by faith every Sabbath. Things Jesus said before the foundation of the world! Sabbath is 7th day, any counter claim is perverted. breaking bread means. meant ending a Sabbath (7th day) fast. there is no implication in that of changing Gods commandment to keep the sabbath. Paul as with other Anti-Semites (holy roman church, Constantine, the roman empire). were determined to destroy not only Judah, the Jewish People but to corrupt Gds law & commandments for personal gain. There is nothing in the valid interpretations & translation of Jesus to imply that he broke any of the Law or encouraged such. Did he not say that he came to fulfill the Law (not prophecy but Law) not to destroy it. all of the knee-jerking, fake deliberate mistranslated nonsense, do NOT change what the Bible says. the 7th day is the Sabbath. Any counter claim is blasphemy & against Jesus’s own words & practices. Seems obvious that what offends bigots from all angles, is that the Weavers being moral people & evidently able t read the Bible & understand it, are adhering to a few more of the 613 commandments that all the phony Christians. They should be a model for Christians everywhere. True Christians are a grafted limb on the tree of JUDAISM AS GOD WILLED. They do not arrogantly change His Laws & His will as he gave to ALL mankind thru the Jews. Here come the “true Christians” in the comment section. You know the zealous wannabe Christians who swear, eat like pigs (gluttony), etc, and don’t follow all the teachings in the Bible themselves, but can tell us that they know the Bible more than others. Who will go to Heaven a Christian or a Believer? Also, there is no sure path to Heaven. Only God can judge you. I’m tired of hearing from certain Christians that they know the Bible more than others English itself is a translated language and not the original language of the Testaments (Greek and Latin are). We can only live our life to the best of our ability as Christians. In the end only God can judge us. Your version of Christianity isn’t any surer than the Amish. which books were written in Latin? most were in Hebrew. It is well know that various “translators” slanted wording to their quirks. To cater to local royalty or Roman authorities, to diminish the roles of women, to reinforce antisemitism. & rarely did they have any scholarly education in Biblical Hebrew or archaic Greek. If you don't know, why do you not know? God is the same yesterday, today and forever! This reminds me of the Ephrata Cloister, founded in the early 18th century, founded by members of the Schwarzenau Brethen (now commonly known as German Baptists) who had come to believe in the seventh-day Sabbath. no, they returned to what God commanded . Any & all excuses for any other day of worship is pure paganism. people have the right to be neo-pagans & have anti-Biblical practices. This is America, BUT do NOT invent distorted twisted excuses for defying Gods commandments. They were used by the Roman church, royalty & governments in Europe & Middle East for centuries to persecute the followers of God’s word. Even here in America we had &still have “blue laws” forcing everyone to adhere to pagan sabbath (Sunday). adhered to it. It is Scriptural, Christian, and not pagan. wild stretch to justify pagan practices. Did the Pope supply the distorted & irrelevant “quotes”. Satan always finds tools to attempt to destroy the word & Laws of GOD. They are a "Different Religion"
These dear folks are not Amish. They are Seventh Day Adventists, or as the Amish would say, “They have a different religion”. That is their right, of course, but they should not try to mix the two. It leads to confusion. It’s impossible to be both Amish and Adventist at the same time. According to Scripture, “a double minded man is unstable in all his ways.” Listening to them, it’s obvious they have changed religions, rightly or wrongly. They are part of what the Amish call “the great falling away”. They are what some call “runaways”, but to others they are simply “ex-Amish”, who are now Seven Day Adventists. From one Minister Andy Miller to another Minister Terry Miller! I have always thought the two minds spoken of were God and Mammon! Please advise me as to which religion is God and which is Mammon! Or maybe we should do as this verse says! I think we would be far better off if we questioned a person about his relationship and not what church he goes to! Peace Brother when our mind is Stayed on and it Trusts Jesus Christ, be he Amish, Mennonite, Beachy, Church of Christ, Seventh day or First Day, matters not, but what have we done with Jesus Christ! Amish is a specific religious grouping, the adherents of Jacob Amman. It is that simple. So yes, they are no longer Amish. The confusion arises from cultural practices. There were & are a number of other Brethren spin-offs, Hutterites, various Mennonites, Old Order German Baptists (mostly now in Indiana in the “Amish” areas). the situation is to some degree caused by our so-reliable media. It labels all “Plain” folks as Amish. Many Mennonites are still plain, but many have CULTURALLY Americanized to various degrees that some are not noticeable. There is a common area of cultural practices & traits held. e.g. the commandment against shaving the jaw for men by “Plain” people. The 7th Day Adventist hold to most of God’s 613 commandments, diet (their version of kosher laws), the sabbath etc. There have been other groups returning to the Law. House of David for example. What most American Christians wish (demand) to be religious morals, standards etc are direct from European & Roman cultural tribal paganism. & perversely assign such to obscure or non-existent Biblical sources. That hypocrisy is understandably part of the disregard & hostility & hatred of Jews (as God’s Chosen). That now we see more anti-religious attitudes from from secular, freethinking or just rational fair-minded people. “Blue” (Sunday) laws are an example. Why would a free people force by LAW (armed troopers) the closure of business, commerce, production on a specific day of the week. Simple. it was & still is hypocrisy, defiance & perversion of, not only God’s law, but the very basis of our Republic (the forcing of religion on everyone by governemnt force). This is an interesting post. I think it brings up the question of what is the definition of “Amish”. Is it a definition that individuals/married couples can make by themselves? Or does a person’s identity as “Amish” also need to be confirmed/accepted by the local Amish community as well as by Amish of that affiliation living in other areas? Just as there are “plain” Mennonites, Brethren, German Baptists, Quakers, etc., I think of the Weavers as Plain Seventh Day Adventists. 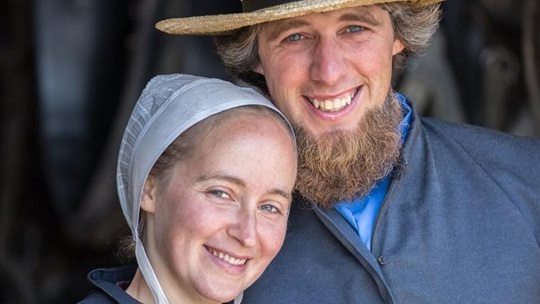 They seem very sincere in their finding a sense of renewal in their Christian faith, and show a strong desire for others, especially fellow Amish, to also find renewal in their Christian faith. In the pictures in this post, as well as in the video which the post had a link to, I observed several children and adults who do not seem to be dressed nearly as plain as the Weavers. It will be interesting to see as time goes on and others from non-Amish background join the Weavers’ church, if the newcomers will be required to dress as plainly as the Weavers, learn to drive horse and buggies, need to learn Pa. Dutch, etc. In a statement in the first part of the video, Andy Weaver stated that the Amish “started out as a culture and has definitely become a religion.” This is an interesting viewpoint. My understanding is that the Amish started out as a “religion”(subgroup of Christianity) and through the centuries, for some it has become a culture as well as a religion. I used to be a part of a reformed Presbyterian Church in the Lancaster area and not long after I left two Amish youth showed up. As it turned out the one young man was the son of a bishop. The bishop as it happened, was a regular subscriber to the credenda agenda, a reformed publication from Moscow Idaho. The bishop had been heavily influenced by the publication and was perfectly okay with his so. Attending the other church. His friend, however,was from a different district and was shunned. I came into the church 33 years ago and we work with Almish, Mennonite, New Order, Charity. Plus others as well. Thank you for a wonderful testimony! 937-515-0863 or 0864. Leave a reply to Amish Seventh-Day Adventists?